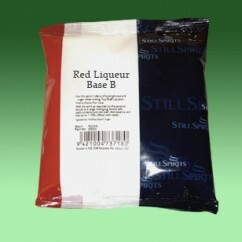 Still Spirits Red Liqueur Base B Use this pack in place of liquid glucose and sugar when mixing Top Shelf liqueurs. Instructions: Add the spirit as required on the essence bottle to a large mixing jug. Slowly add the contents of the pack and mix well. Add essence and top up to 1.125 litres with water. As liqueurs are different in sweetness, thickness and strength, Still Spirits have taken great care to provide you with base packs specific to each liqueur. Liqueur base "B" is a medium level thickness and sweetness.